I enjoy the "What I Wore" feature by Chloe Malle* in the New York Times, one of which recently described designer Cynthia Rowley's outfits over the course of a week or so. Madonna! CR has the clothes, the eye and the brio to assemble a fabulous, free-spirited mix. For example, her vintage black goat-hair capelet worn with her own ostrich feather skirt! A cashmere Prada walking coat with a needlepoint bag: intelligent, original combinations. A browse through her web site shows the same attitude: unafraid of quirk, but with classic references. While a lot of her designs skew short and I don't yearn for the feathers, the silk Tetris ($395) would make a memorable cocktail dress. A grey knit dress ($229 on sale) has fabulous sleeves and a wink of striped grosgrain belt. Rowley is compared to the magnificent Clare McCardell, and here you see the reference clearly. I liked the cut of her denim pants that fit at the hip, then ease like palazzos, with two front pockets (another McCardell signature) and gold zippers at the sides. But size M is the largest on the site. Rowley is a whippet of a woman. I've always thought that women designers essentially design for their own bodies. (Thank god for Donna Karan.) Rowley adds one more skinny piece of data to my proof. Her "Large" is a 10; there is no XL. I've written and talked with designers to beg them to make larger sizes. (There is a limitation concerning fabric width, but many designs can be made up to 16-18. The largest sizes use specially-milled fabrics.) Guess who's with me on this? Simon Doonan, who says he is tired of seeing voluptuous women crowded around the jewelry counters of Barney's because "that's all we offer them". Cynthia is on my list. With her talent, she could easily make a contribution to 50+ women's choices. At 50 herself, she might be open to influence. We need clothes like that grey knit dress, wearable but interesting, not wildly expensive, well-made. This dress from the Spring/Summer '11 collection is not on the web site, but I would buy it in a heartbeat if offered in my size. The world of grown-up women needs more clothes like Cynthia Rowley's and we need them beyond a 10. For your sake or that of your friends, please ask designers, buyers, even floor staff to provide more size diversity, especially in better-quality clothes. *Chloe Malle is the daughter of Louis Malle and Candace Bergen; one to watch. in the largest size it comes in---a small 14 (small by hip measurements) and it arrived yesterday and fits! You will note that it is also long. So many dresses I cannot wear because they are too short to be proportionally right on my body. The above dress is flattering and I am very pleased. It is so frustrating to be "too large" for many lines of clothing when I feel like I am probably fairly average in size for a 59 year old woman. Susan: That is one great dress ,and silk jersey is such a perfect fabric for travel. I look for that length all the time. Ah, perfect! The average North American woman is 12 or 14 (depending on whose sizing you are referencing). So, where are the clothes? Great post. I believe, many years ago, Cynthia Rowley, was on Oprah and the audience kind of badgered her about why her clothes were so small. I don't quite remember why she said she couldn't, something about how the machines couldn't cut higher than a size 12...it sounded bogus to everyone, and I think the audience almost had her in tears. But, obviously, no changes were made to her sizing. The outfits you show are stunning. Let's hope if we all make our wishes known, she will take our suggestions to heart. Hear, hear!! I still say designers are cutting off their profits at the knees by not offering sizes in a larger range. Susan, that's a gorgeous dress! Wish I could find something like that in a smaller print (that print would swallow my 5'1" frame whole). Preach it. I wear a 10 and can rarely find anything from higher-end retailers. Yes, Yes, Yes. I am so tired of the myth that larger women won't spend on well made clothing. We will! Not to mention that most of us over a size 10 look far better in well cut, body skimming items and not the tent like offerings from many plus size line. 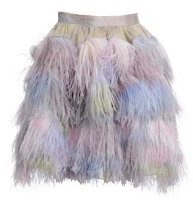 I love bags and shoes but would like to be able to purchase interesting clothing with my money; not just accessories. I notice that even svelte Cynthia seems in the picture to be playing cleverly with layers, possibly to distract from a no-longer-perfect waistline? I agree with you: she could lead the way, and seems approachable. There are so many gorgeous dresses out right now--why should they be limited to youngsters and starved (because that seems to be what it takes to be truly thin after 50) older women? Lead the revolution, Duchesse--we're all behind you! 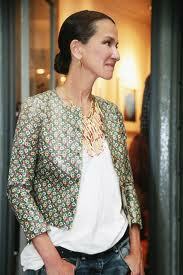 By the way, have you ever seen pictures of Cynthia Rowley's long hallway in her NY apartment? It's all plain white, but with changeable lighting: with a flip of a switch, the hall glows pink, melon, celestial blue. A woman who could design that has whimsy and a sense of humor. Deja Pseu, I actually thought about you when I ordered this dress---that the print is too large for shorter women. I'm 5'8" tall (I wish I was even taller) and I knew it would work for me. I ordered another dress from Diane Von Furstenberg as well---same exact style, radically different colors and print. I DID notice that her website has dresses with much smaller prints as well--but most of them were not the longer length I require. I AM going on a restricting portion size reorganization and hope to be back to a size 10. The good thing about these two new dresses is that that will work even if I am a smaller size. Right now they snugly ( but not tight, and I look voluptous) but they could fit looser like they do on the models. I'm glad you like the dress Duchesse. By reading many design blogs and listening to what everyone says, I am getting a better handle on what flatters my body. Thank you Duchesee, Deja Pseu and Already Pretty. Anon@8:43: It's accountants, not designers making those choices much of the time- they track how many units sell through the (limited) size range. A few designers have also been quoted saying they do not want their clothes out there in larger sizes. All: I'm gonna keep talking about size limitation to all concerned, and hope you will too. C.: I vaguely remember that about her apt, maybe in Vogue? Must be stunning and what an idea. laurieann & Jane W: A local fashion writer once said "There are women standing on the street waving wads of cash. All they want are good clothes over a size 10 cut for their bodies." Some of Diane Furstenberg's dresses on here website are selling out first in sizes 10, 12 and 14. That should tell them something. I'm just grateful she made these sizes! Thinking a bit more about the subject of size and fashion, I remember a couple of challenges on Project Runway involving designs for non-models (one required each contestant to design for another's mother!) The pouty distaste the young designers showed for the task was infuriating; they clearly felt that they were working under a handicap. Why don't design schools emphasize to students that their future livelihood depends on the ability and willingness to DRESS WOMEN--not mannequins or size 2 six-footers? Clothes for stick figures are easy. Chic design for a normal range of shapes and sizes demands real creativity. I am tall and large. If I were the same proportions but shorter, I would fit standard size ranges. But because I'm 5'10", I'm borderline plus size. That has always seemed a bit of an injustice to me. The truth of the matter is that designers don't want 'fat' women wearing their clothing and representing their lines in public. Thank god for Eileen Fisher and Talbots, where I can fit into a L most of the time. :) And I think I represent their brands well. Susan: Yes, she has a decent range and her clothes are good value. Anon/C: My sentiments exactly. Some of the very young designers act like children who are not allowed to play with their favourite toys when they cannot design outrageous evening ensembles for Ms. Klum. rb: Sounds as if we are the same build. A devil of a time: misses dresses (and EF pants) always too short, plus size too boxy. Sometimes if I find something that fits, buy whether it complements my wardrobe or not. Not that happy with Talbots, either. What do women our size in Italy do? I don't know what women our size (I'm a relative shrimp at 5'6", and with a slightly larger go-round) do in Italy, but I'm pretty sure that when I get to Spain I'm going to have to get back into the habit of either making my own clothes or jaunting off to London to buy them. Or maybe I'll start my own clothing line - ha! And it's also very likely that I'll revert to a much smaller wardrobe, as was the case the other times I lived in Europe as well. 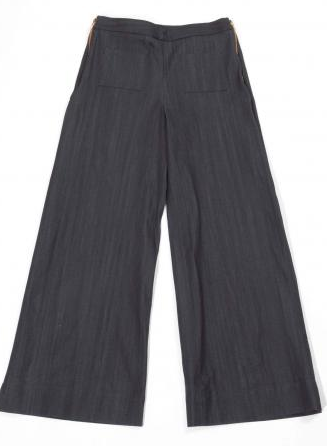 I don't fit EF's pants either (not that I would necessarily want elastic waist pants) so I buy the Long size from Talbots or order NYDJ in extra long from Nordstrom. Fortunately, I'm not much of a pants-wearer, and I find I can usually let a skirt hem out a little. The past season with the above-knee hemlines was a problem for me, so again, thank goodness for Talbots because they didn't go that short. rb: I've bought pants from Talbot's; letting down skirts hasn't worked well for me, perhaps carry more of my height in legs than you. I too prefer skirts but so hard to find. I'd say not a big loss. I have a cashmere short sleeve cardigan from CR. The quality is nowhere near the price tags. After only one season of occasional wear (maybe 10 times) the piece looks sad. I also started seeing more CR at Marshall's (sister store of TJMaxx). I would not even pay the heavily discounted prices for the quality. Anonymous: Thanks, I've only seen several dresses from 4-5 years ago, decently made. Since the recession many designers have cut their quality, sounds like she is yet another.